AMMAN, Jordan Syrian government forces appear to have recently made use of cluster bombs, weapons banned by most countries because of the danger they pose to civilians, a New York-based rights watchdog said Sunday. Human Rights Watch said in a report that Syrian activists posted at least 18 videos on Oct. 9-12 showing remnants of the bombs in or near several towns, which included the central city of Homs, the northern cities of Idlib and Aleppo, the countryside in Latakia, and the Eastern Ghouta district near the capital Damascus. Many were on a north-south highway that has been the scene of fighting in recent days. Cluster bombs are of particular concern because they scatter small bomblets over a wide area. Many bomblets do not immediately explode, posing a threat to civilians for long afterward. "Syria's disregard for its civilian population is all too evident in its air campaign, which now apparently includes dropping these deadly cluster bombs into populated areas," said Steve Goose, the group's arms director. He said cluster bombs "have been comprehensively banned by most nations, and Syria should immediately stop all use of these indiscriminate weapons that continue to kill and maim for years." The group did not have information if the munitions had caused any casualties casualties. Human Rights Watch "is deeply concerned by the risks posed by the unexploded submunitions to the civilian population, as men and even children can be seen in the videos handling the unexploded submunitions in life-threatening ways," according to the report. The military publisher Jane's Information Group lists Syria as possessing Soviet-made RBK-250 cluster bombs, the report said. It said there was no information available on Syria's acquisition of the weapons. 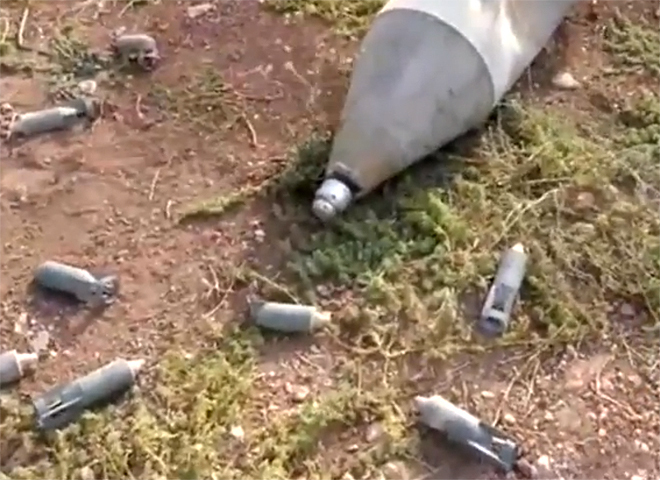 Human Rights Watch had previously reported cluster bomb remnants found in Homs and nearby Hama this summer. More than 32,000 people have been killed in Syria since a revolt against President Bashar Assad erupted 19 months ago. Hundreds of thousands of Syrians have fled the fighting between the rebels and the army, which has been using missiles, tanks and warplanes in strikes that devastated whole neighborhoods. Earlier Sunday, Syrian gunmen fired on a bus transporting workers to a blanket factory, killing four and wounding eight others, a Syrian official said. He said the attack happened at the entrance of Homs. He gave no other details and spoke anonymously as he was not authorized to make press statements. The Syrian state news agency said a suicide bomber crashed an explosives-laden sedan into a coffee shop at a Damascus residential neighborhood, causing damage but no fatalities. SANA said the explosion took place at dawn on the capital's Mazzeh highway. An Associated Press reporter at the site says the blast destroyed a balcony and ripped off a building facade. In neighboring Jordan, Syrian refugee Mustafa Ali Kassim, 24, died of shrapnel wounds inflicted when the Syrian army opened fire at his group of 229 Syrian refugees while crossing a border fence into Jordan before dawn Sunday, said Syrian refugee camp spokesman Anmar Hmoud.